A few weeks ago, in It’s Personal – Part 1, I started talking about some of the ways I’ve tackled the development of the gardens here at Hayefield, in response to some readers’ questions. I ended that part by mentioning that I have a group of plants that I rely on for filling new gardens. 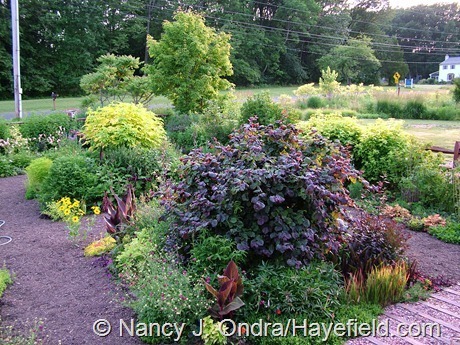 Here are some of my favorites, along with a few more thoughts about planting and maintenance and some more pictures of how the gardens have evolved over the last decade. 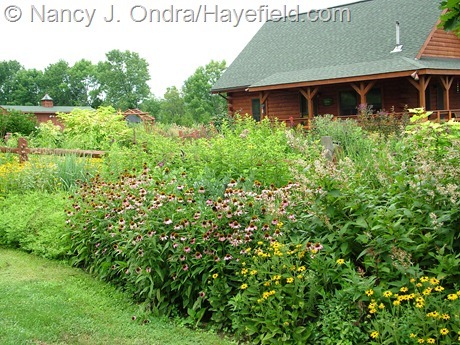 For me, a good starter perennial is one that thrives here without supplemental water after the first year, that flowers the same year I plant it, and that looks at least pretty good through the whole growing season. It has to fill out relatively quickly, so I can divide it every second or third year, if I need more of it, but it also has to be able to stay in one place for a long time if I don’t have time or a reason to divide or move it. It needs to tolerate hard pruning, too, in case I want to control its size or give its companions a chance to fill out. 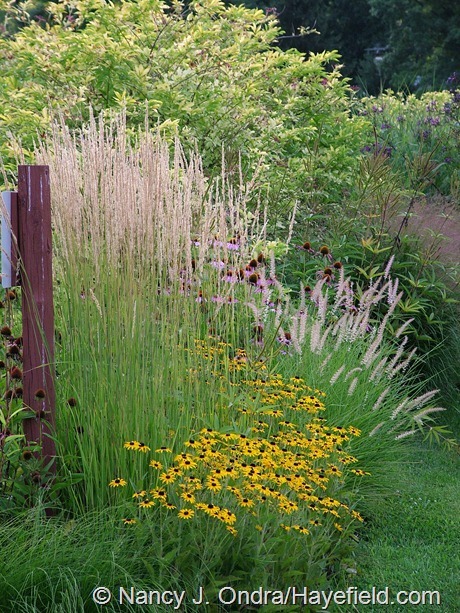 That’s a lot to ask, but I’ve found a nice group of plants that make my list of go-to perennials. Aromatic aster (Symphyotrichum oblongifolium) arches out where it has the room, but it also does a nice job mounding around the base of taller companions. If you want to keep it smaller, you can cut it back by half in early to mid-June. 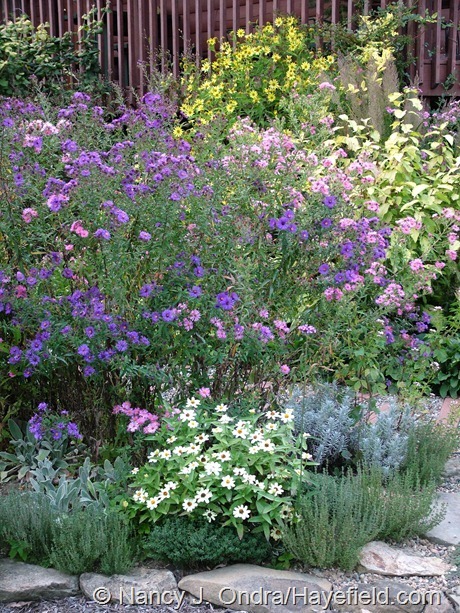 New England aster (Symphyotrichum novae-angliae) gets tall if you leave it alone, but you can keep it shorter by cutting it back by half in late spring or early summer. 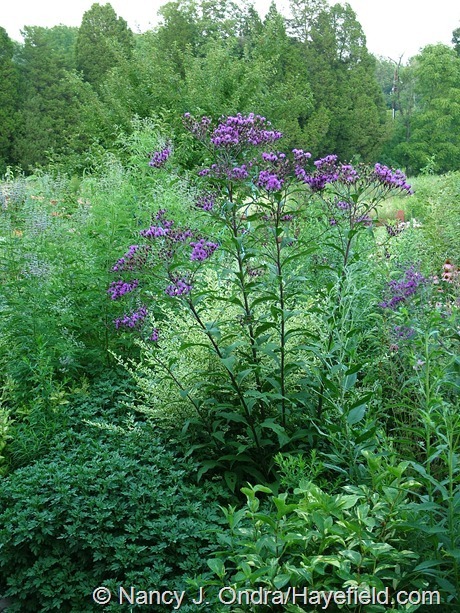 New York ironweed (Vernonia noveboracensis) is great for adding height, and it flowers even when very young. It also seeds around freely, which was great when I had a lot of empty space to fill, but now I make sure to dig out the seedlings while they’re still small if they’re in the wrong spot. Joe-Pye weed (Eutrochium [Eupatorium] maculatum) generally gets quite tall (see the pink domes in the background), but a hard trim or two in summer can keep it low and bushy instead, like the one in front. Ordinary, seed-grown purple coneflowers (Echinacea purpurea) make dependable, long-blooming, inexpensive fillers for big borders. Common? Certainly. 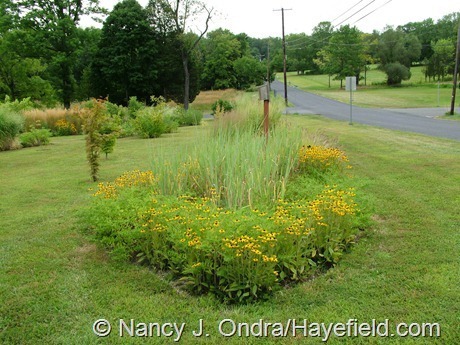 But orange coneflower (Rudbeckia fulgida) has been invaluable for filling space and supplying late summer color. 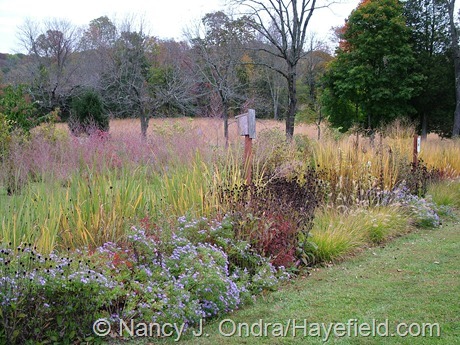 I like many ornamental grasses, but the switch grasses (Panicum) are among my top favorites, due to their variety of heights, habits, and colors. Above, ‘Rotstrahlbusch’ is in the middle and ‘Dallas Blues’ is in the background. Then there are the sure-fire annuals that I count on to fill space around new perennials. These have to be super-easy to grow from seed or cuttings, with a long season of bloom and/or great-looking foliage. 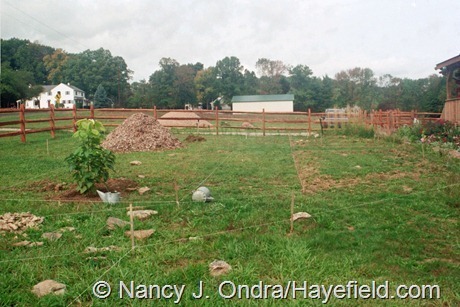 They also have to fill a good amount of ground space, or else supply noticeable height by mid- to late summer. ‘Triple Curled’ parsley (Petroselinum crispum) is an excellent filler for the front of a border. 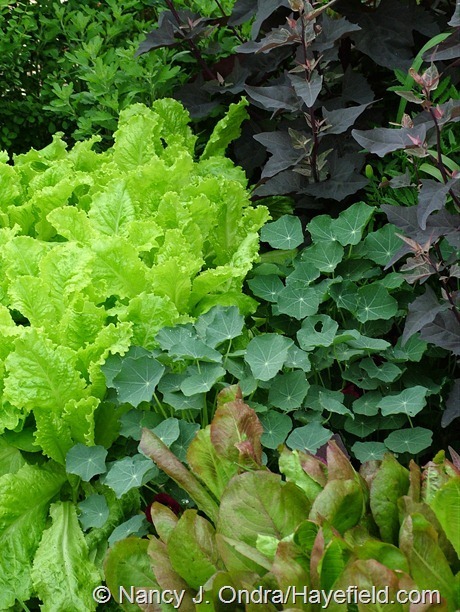 It’s easy to grow from seed, and its bright green leaves complement any companions. 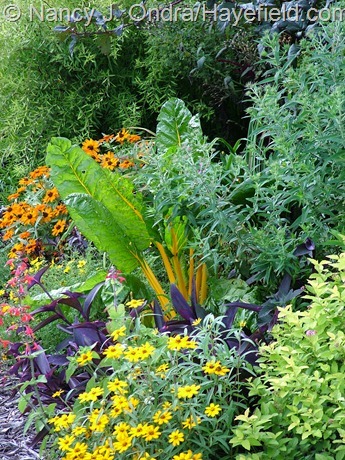 Sometimes you need big, broad leaves to contrast with the finer foliage of many common flowers. Swiss chard is great for adding a bold touch of texture as well as color. I wouldn’t be without zinnias, either, for their long flowering season. 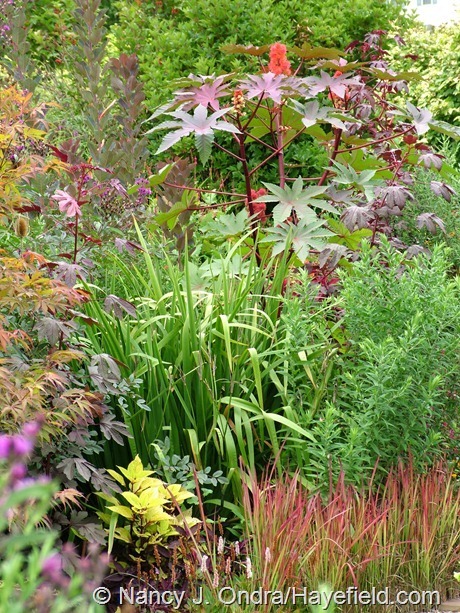 While you’re waiting for shrubs and tall perennials to fill in, consider adding a few castor beans (Ricinus communis; above is ‘Carmencita’) for height. If you’re not comfortable with growing castor beans, consider trying corn as an annual filler for height. 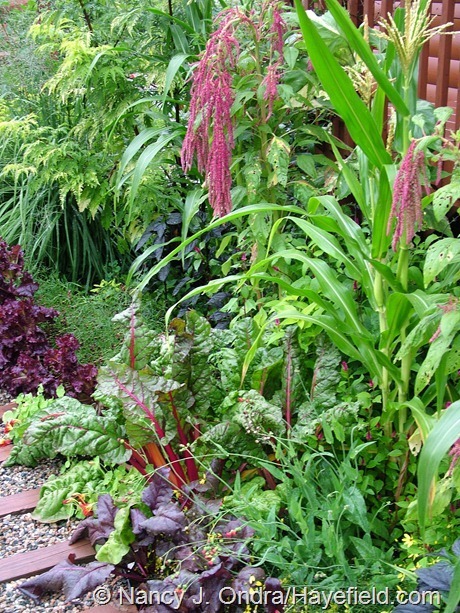 This is ‘Strawberry’ popcorn, with solid green leaves on 4- to 5-foot stalks. The variegated kinds, like ‘Quadricolor’ and ‘Tiger Cub’, are super, too. 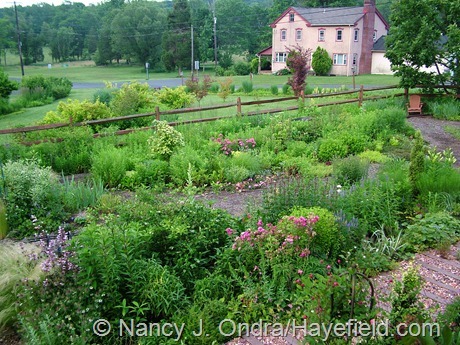 In a new area, I use as many perennials as I can, then fill in around them with the annuals. The idea was to eventually have the garden be all perennials, but I can’t give up on my favorite annuals entirely, so I decided to leave some space for them. 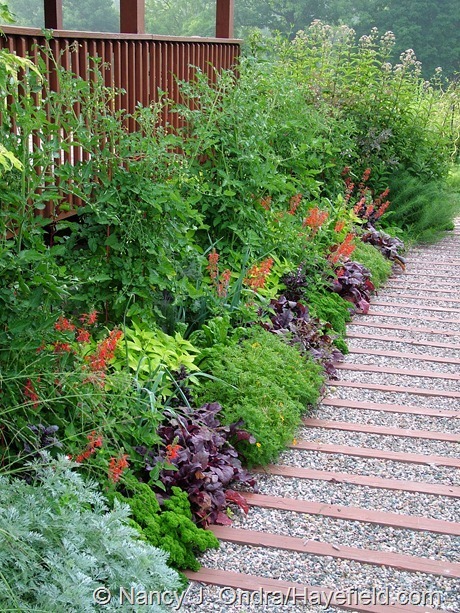 In some areas, there’s a 12- to 18-inch-wide strip along the front of the border, for low-mounded and creeping annuals and tenders. 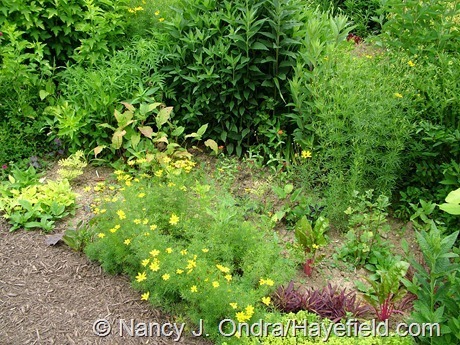 In other spots, I removed some perennials to make larger niches 2 to 4 feet in from the edge, for chards, regular zinnias, and other medium-sized to tall annuals. 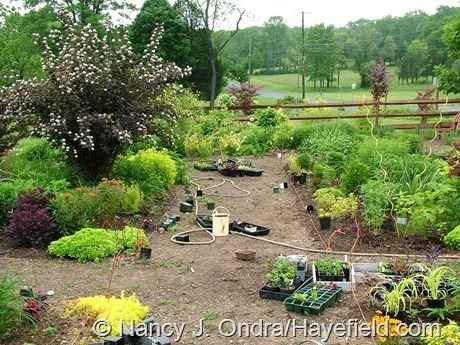 And in the foundation border out front, I chose to transplant all of the perennials to other places, so I could freely experiment with different colors and combinations of annuals and tender perennials there each year. 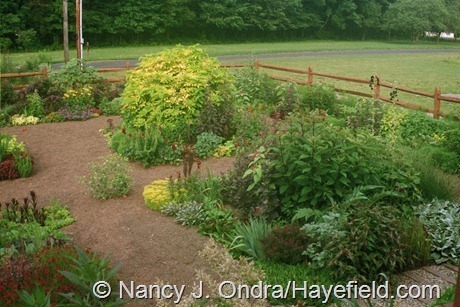 The Foundation Border at Hayefield (July 2007): I moved most of the perennials to other spots, so I could experiment with annuals. This year, it was mostly edibles. I used to race to get the annuals out as early as possible – even in late April, though our last frost date isn’t until around May 10 – to get the longest season of color. 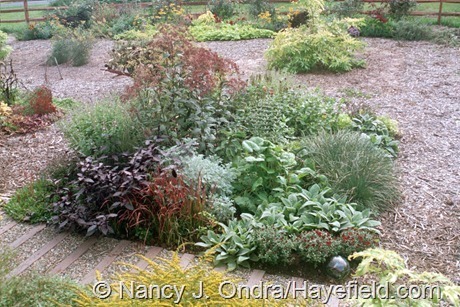 I found, though, that I wasted a lot of annuals that way, because I didn’t take into consideration how much space the perennials were going to take up, and many of the annuals got smothered. In the last few years, I’ve held off planting the annuals and tenders until mid- to late May, and that’s worked out much better: the annuals and tenders are larger then, so I can better estimate how much space they’ll fill; they take off more quickly, since the weather is warmer; and I can easily see how big the perennials are likely to be, so I can better place the annuals in spots where they’ll fit comfortably. 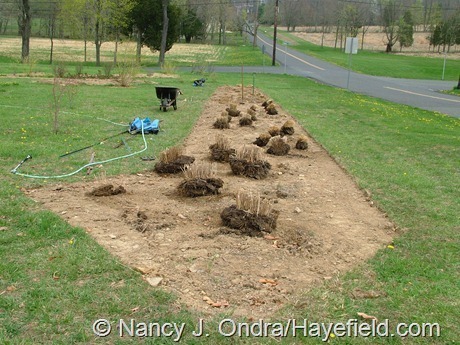 Since late May is when I usually cut back many of my perennials, I can set aside a full week or two to do everything at once – cutting-back, planting, and weeding – and then settle back to doing “real” (i.e., paying) work once it gets hot in June. 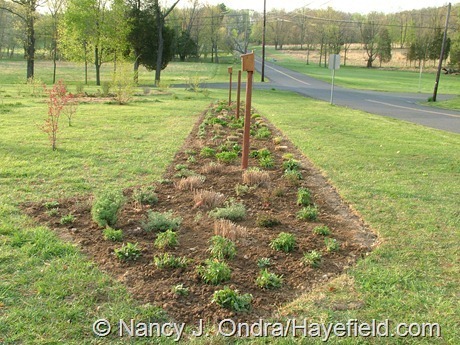 The Front Garden at Hayefield (late May 2010): Let’s get growing! I won’t get into the specifics of what I cut back and by how much. (I’ve already covered a lot of that in The Perennial Care Manual.) 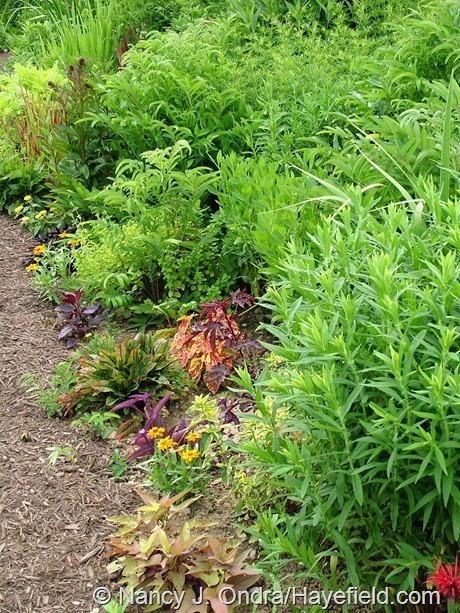 In general, though, I shear most of my established perennials back by at least half, or even harder if I want to keep them smaller. This hard pruning helps to reduce their vigor, so I don’t need to divide them or thin them out as often, and it reduces their overall height, which means that the tall ones are less likely to sprawl without staking. 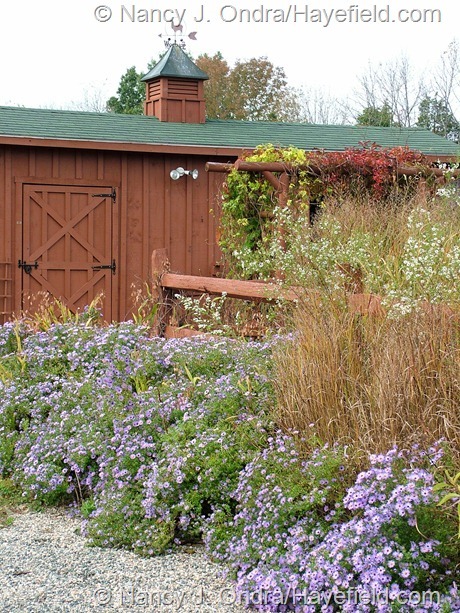 It encourages the spring bloomers to send up a flush of new leaves, and it delays the flowering of the summer-bloomers for a few weeks, so I end up with a spectacular show of flowers and fresh-looking foliage in August and September. 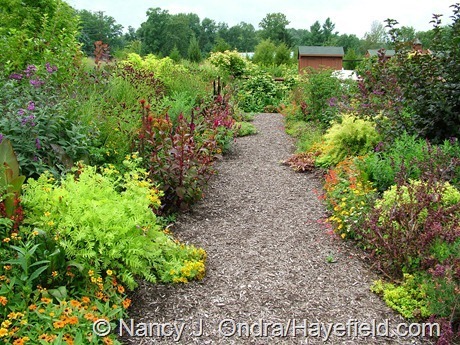 The down side to this approach is that most of the garden looks pretty much like a disaster area from late May to the third or fourth week or June: exactly when most people expect a flower garden to be looking its very best. 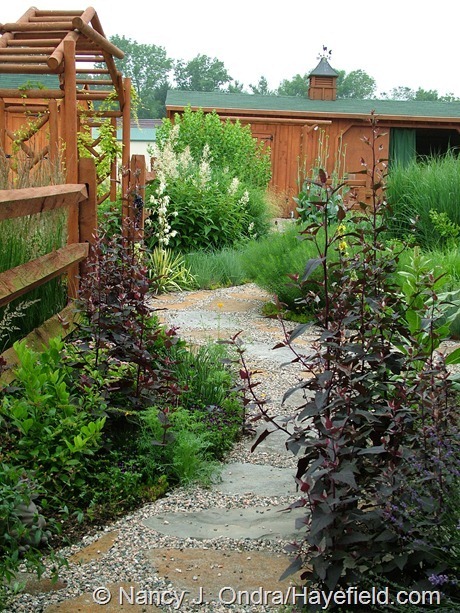 This combination of late planting and drastic pruning isn’t well suited to the typical “beautiful” garden, especially if you want to attract visitors and show off your gardening prowess with early-summer garden tours. But when you have a “personal” garden, you can get away with it with no trouble; if it works for you, that’s all that counts. Well, that’s more than enough preaching…next time, back to the pretty flower pictures, I promise. To finish, a few more sequences, as a reminder that a loved garden is always a work in progress. 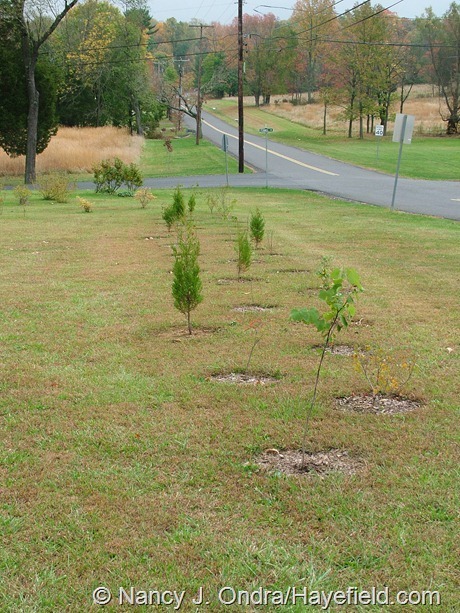 The Future Long Border at Hayefield (October 2007): A few months after planting all of these little trees and shrubs in the spring, I decided that I wanted something that was going to be showier for such a high-visibility spot. 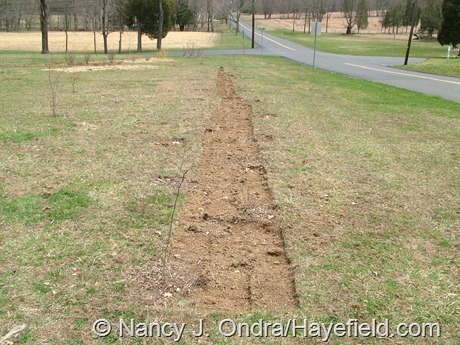 The Long Border at Hayefield (April 8, 2008): After moving the woodies to another hedgerow-in-progress, I removed the grass with a manual sod cutter. I always love seeing your before and after photos Nan. I even like seeing the work in progress with your tools etc out in the paths. It all seems like magic until I see those tools. I know you work so hard in your garden which is why it is so fantastic. Truly an inspiration. 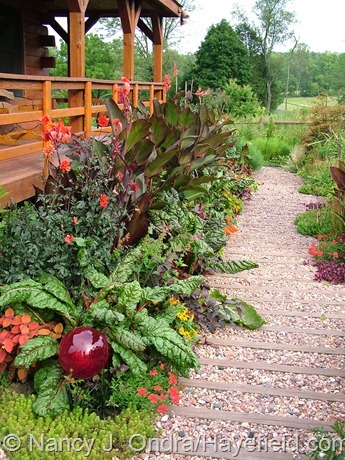 I always think I would love a garden like this. Then I read “sod cutter”. I think of what a job that would be even with this tool. Ha.. Am I the lazy gardener?? tee hee… Haven’t seen photos of your fertilizer makers lately. I hope they are doing ok. I like seeing the tidy pictures, Lisa, because in between photo sessions, I tend to leave pots and tools and weeding buckets scattered around. Oh, yeah – using a manual sod cutter is pretty brutal exercise, though it’s marginally better than using a spade. I’m not a huge fan of power tools, but if I could go back to the beginning and change one thing here, I’d have invested in a power-driven sod cutter. Though, it’s probably just as well I didn’t, because I can just about manage the gardens I have now. And yes, the boys are fine; they thank you for asking. They’ve mostly been lazing in front of the fan these past few weeks. But they (not so) graciously allowed some photography yesterday, so they will likely appear in my August Bloom Day post. Thanks for the step back in time, Nan. There is so much inspiration here in your processes. Using reliable plants that can be divided works here too, we use the same ones, in fact. 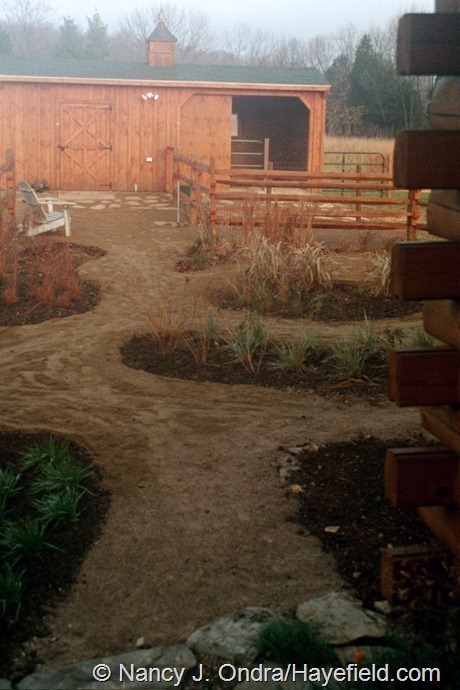 The setting out of the paths and beds shows what an artist you are, one with long term vision. That’s so cool, Frances – that the same plants work so well for you, even though we’re in different climates. It goes to prove the saying “Common plants are common for a reason”: because they’re easy to grow and thrive in a variety of conditions. I still love the quirky and unusual ones, but it’s tough to fill a large garden with only rarities, unless you have an unlimited budget! 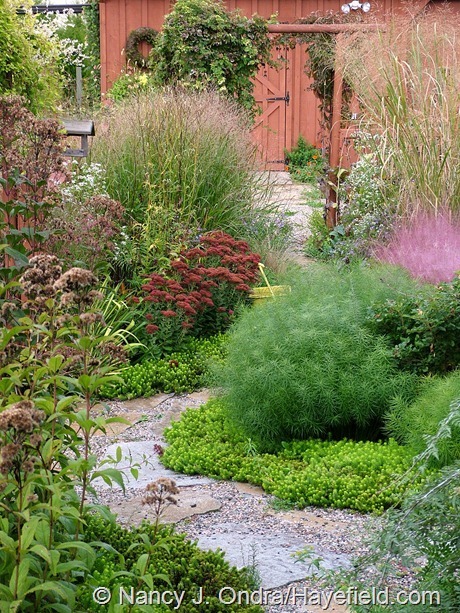 This is an exciting evolution in your immense and fabulous garden. You can tell when you enriched your collection and your knowledge gained in these years. As for The Border Foundation …….. maybe I liked the lightness of 2004. Congratulations, your posts are always more fascinating! Hello Tiziana! Great to hear from you. Yes, the earlier incarnations of the foundation border were rather more tasteful, and they were pretty in their own way. 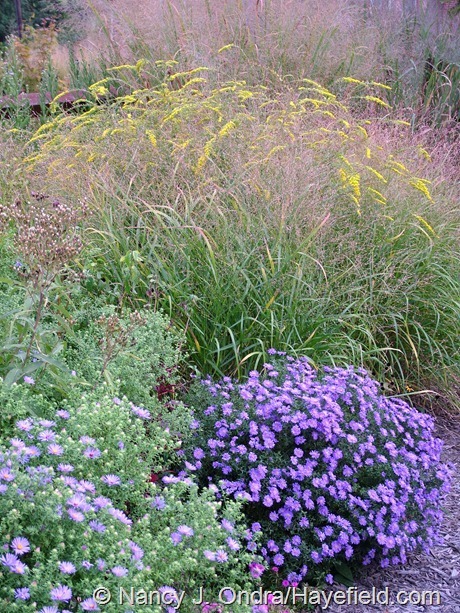 I have to admit, though, that I love having that area to go wild with crazy, high-impact annuals and tender perennials. Happy gardening to you! I love every one of your photos and posts, and these before/after shots are so inspiring! The advice on perennials is so welcome too! Thanks! Hey, Alan. I can’t imagine that I told you anything you didn’t know, but thanks for reading anyway! After getting a feel for the land, I get how you can go out and lay out a garden in a nice flat meadow, but… You must lay out some of it on paper… Yes? 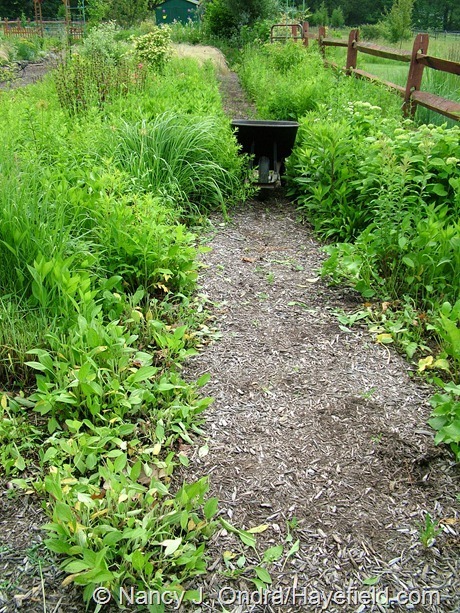 Are you getting by on the rainfall that God sends, or are there irrigation lines buried down the center of those paths? Beautiful pictures as always… I despair of ever getting my personal gardens to the point where wide angle shots are pleasing…. Hi there, Stone. I think it looks a lot bigger than it actually is – inside the fence, anyway. The only part I roughed out on paper was the front. 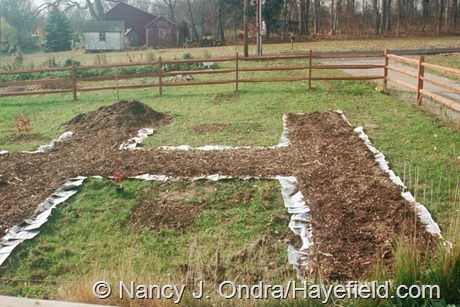 My original plan was for a four-square garden, but since the space is rectangular, it ended up being a two-squares-and-two-kind-of-rectangular-areas garden. After that, the rest just sort of evolved. No installed irrigation here: mostly just spot-watering with lots of hand-carried buckets, or, if I really get desperate, a couple of hoses dragged around from the faucet out back. A wonderful post! 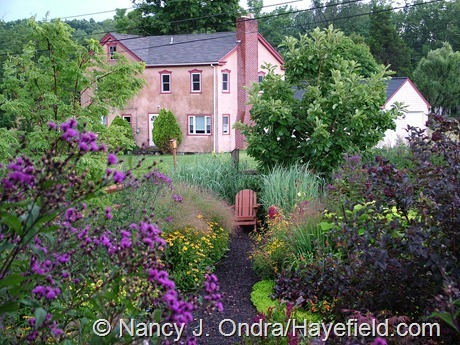 Seeing the transition over time gives the rest of us hope that we too can have a beautiful, diverse “Hayefield-like” garden inspite of the size of our particular parcel of ground. Thank you. Thanks, John! Even though we have different styles, it’s great that we can appreciate each other’s gardens. Take care. Another inspiring and informative post, Nan! Beautiful as always. 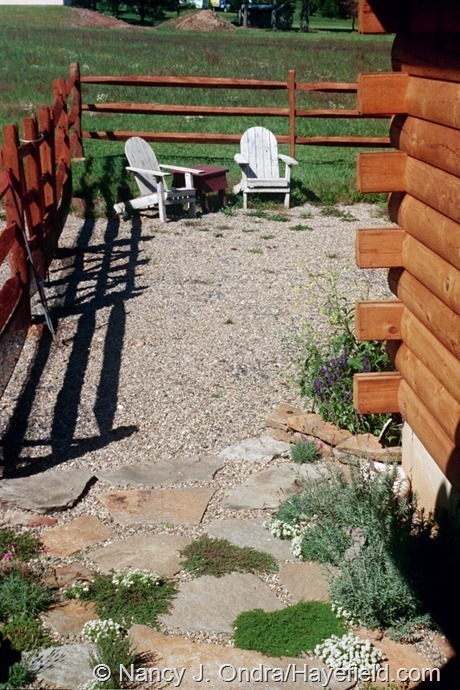 I am curious if you have any favorite plants that do well between the stones in your courtyard. 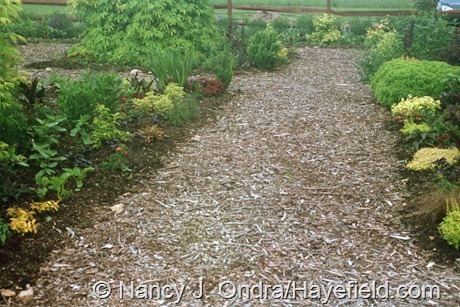 I have a similar path, and am trying to find something that likes growing in gravel. 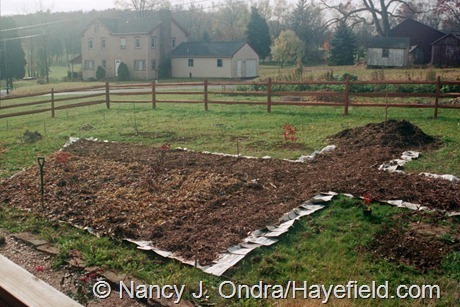 Thanks again for sharing your garden – I love what I learn from you! Ugh – mostly, the things that grow best between the stones are weeds (and not the weeds you can pretend are ornamentals, either). I’ve been letting a few things creep in from the sides, like ‘Angelina’ sedum and creeping bramble (Rubus pentalobus), but it takes regular trimming to keep them from covering the stones. I can get creeping and wooly thymes going sometimes; they tend to rot out after a year or two, though. Another problem is shoveling in winter, since I walk this path multiple times a day to get back and forth to the barn; it’s tough to remove the snow without shoveling out the plants too. So, as much as I’d love to have one of those incredibly photogenic planted paths, I’m resigned to mostly just keeping the weeds pulled. Sorry I can’t be more helpful, Carolyn. Incredible Nan! Love to see the evolution. 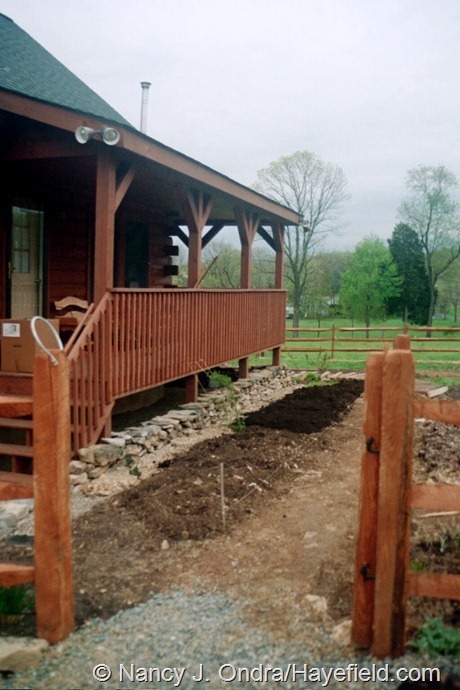 I remember when you put in the gravel with timbers, and it still looks wonderful. What a place you have! You’re a beacon for the rest of us. Heh – I can remember what *your* garden looked like the first year and how amazing it looks now, Benjamin. Having a reason to take photos of our gardens many times a year over multiple years has to be one of the best reasons to keep up a blog. I never did have luck keeping up with an on-paper garden journal, but this has been a great incentive for building a visual record of the progress. Wow Nan, thats a great list. I too am adding more unusual or edibles for interest. You have given me a few more to look for. Love that ‘Popcorn’ and the chards. I grew creeping zinnias last year, but they didnt reseed. Looks like I will be seed shopping soon! Hi Brooke! I haven’t had any luck with creeping zinnias (Sanvitalia) seeding here either; some times they do well, but just as often, they seem to rot out. They’re definitely not as dependable here are ordinary zinnias. The plants of ‘Strawberry’ popcorn are nice, and the short cobs of tiny, densely packed, deep red kernels are really cute for fall and winter decorating, too. So many nice combinations Nan, but my favourite is really “The Foundation Border (September 2010)” ! Ooh, yeah – I really liked that one too, Nicole. I’ve included much less chartreuse the last two years, in favor of more red flowers and dark foliage, but I may go back that way next year. Awesome as always Nan. 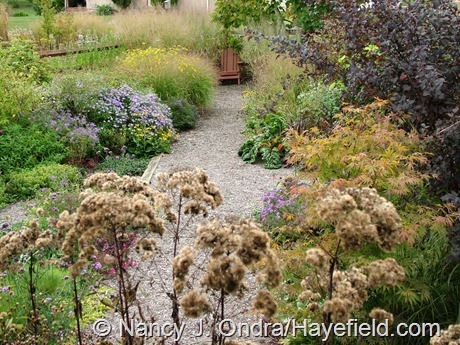 I too loved the Foundation Border in Sept 2010. A very beautiful mix of texture and colour. Also, if you have to have a large house belonging to someone else in your garden view, that big pink one is hardly an eyesore! I thoroughly enjoyed travelling through the years. Hi Kerry! The borrowed view certainly could be worse. My aunt and uncle lived in that house, so I think fondly of it, though I’m even more pleased to have their old barn as part of my view. I can see Mom and Dad’s house from here too, but it doesn’t really show up in pictures. Anyway, I hope your garden projects are proceeding well. Don’t work *too* hard! You’re right, Kate: there’s a lot of chard at the base of the cannas out front. In that Front Garden shot, the chartreuse on the left is ‘Isla Gold’ tansy (Tanacetum vulgare); on the right is, yes, Mellow Yellow spirea. The baptisias really do come back; mine do, at least! 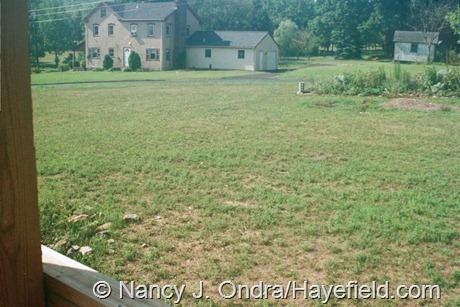 I took that after-cutting shot on June 12 last year; below is what those same plants looked like on June 27. 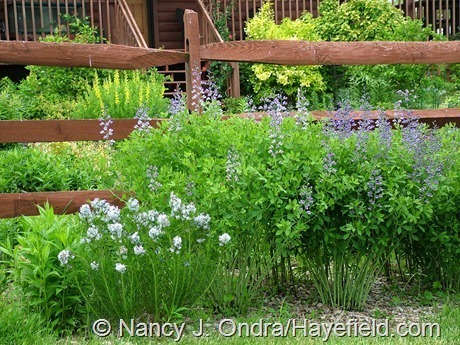 Nancy, I’ve been a devoted follower of your blog for many years, and it’s been a treat to watch your garden grow. 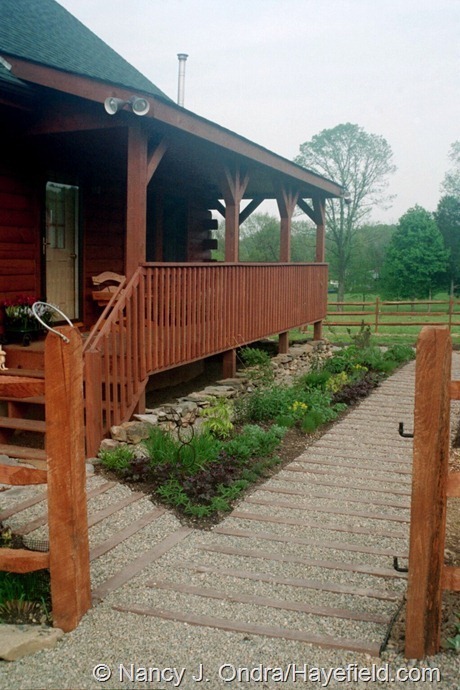 One question: I live in a similar area in NJ, and have to wonder, does that fence of yours keep the deer out? 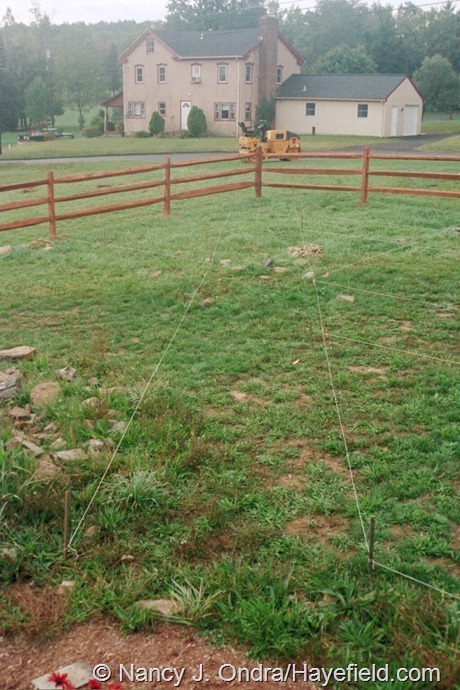 I could never grow half of what you have without a serious, 8-ft high deer fence. A double welcome to you, Marfy. 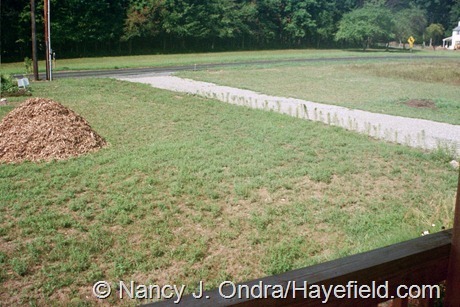 The short answer is no, the post-and-rail fence is no barrier to deer. Usually, however, they don’t bother popping the fence to get in. 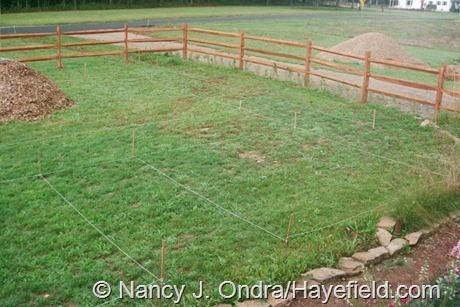 The deer had established paths before I built my house, and I’ve made sure that I don’t plant or put pastures where they would block those paths. The deer do wander through the meadow and shrubbery and either eat or rub the woody plants out there, but I’ve accepted that and let the plants recover or die without intervention from me. Keep in mind, though, that my neighborhood is quite rural – mostly farm fields and woods and no big developments – so there are a lot of other places for them to be. Believe me, I know how lucky I am, for now at least. There are at least three does around here right now with twin fawns, so the population is building very quickly. 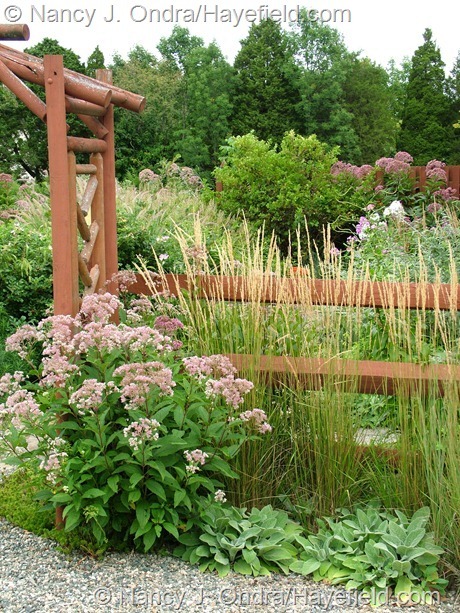 Even if most of the plants you have planted doesn´t excist here in Sweden, the overall ideas give me lot of think on! So – thank you!! Sorry to show you plants you don’t have, Susie. It didn’t even occur to me that the perennials I chose were all U.S. natives. I’m sure you have your own collection of favorites from your own region, though. This series is so terrific. I have found it very encouraging and instructive. Thanks for doing it. It was a lot of fun for me to put together, Kim, going back through all those old photos, and knowing that you and others have found it of some interest has made it all the more worthwhile. Thanks so much for visiting! I love your before/after posts…so inspirational…I don’t think I ever realized your long border was so close to a road! Love the courtyard plantings so much (although all the plantings are fabulous). I love that you do the foundation with annuals each year, it’s a perfect excuse to try something completely different. 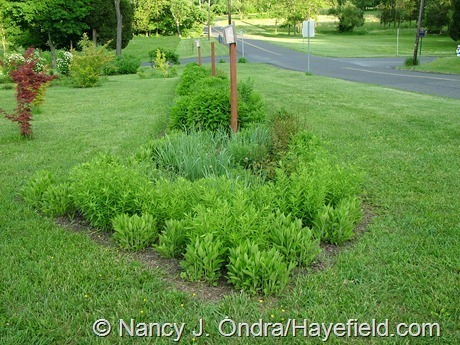 Funny, I was scrolling down to leave my comment and saw I wasn’t the only one amazed that you can shear Baptisia back so far…haha! 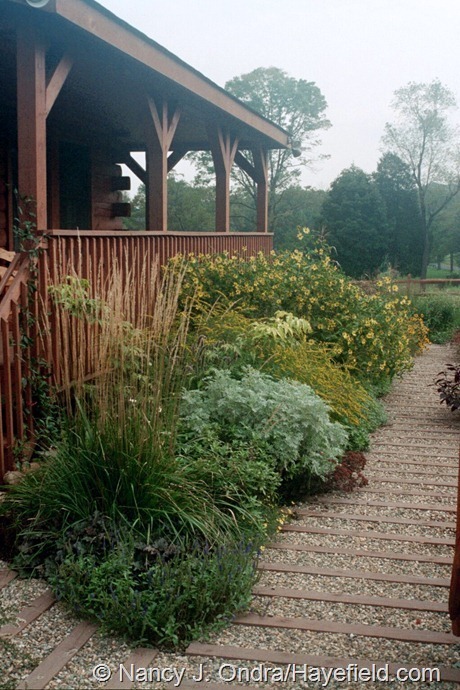 I think that shot of the Panicum and Goldenrod is so dreamy…such a perfect combination. Thanks, Scott! Yes, it took me a while to try cutting the baptisias back that far. But I had a bunch of white baptisias growing in a part of the meadow where Canada thistle crept in, so I ended up mowing everything there to 4 inches. I was thrilled to see those baptisias come back beautifully, and I figured I could get away with a hard cut-back on the established clumps in the garden as well. It’s been a big help in keeping them looking nice without crowding or staking. I really appreciate you sending more readers my way, Gail. 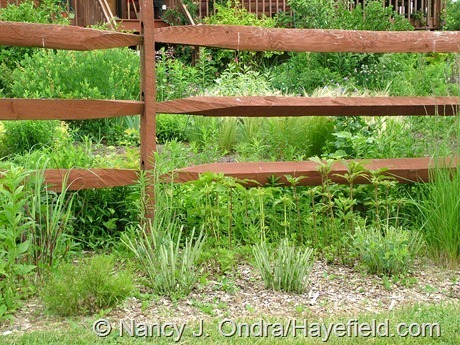 On the ironweeds and Joe-Pyes, if I have clumps that I know were really tall the previous year, I’ll cut them all the way to the ground in late May, and they usually regrow to about 4 feet by their August bloom time. If I want them to be more like eye level, I’ll cut back only to about 2 feet. Love the before and after pics. That’s what really tells of how much work went into one’s garden. I’m sending this to my students for inspiration. Thank you for these wonderful, informative and very inspiring posts. Wow, Sandi – thanks for thinking it was worthy to share! I hope you’ve been enjoying some of the rain we’ve been getting over here. Hi Nan, I enjoyed this post and like others found it quite informative. 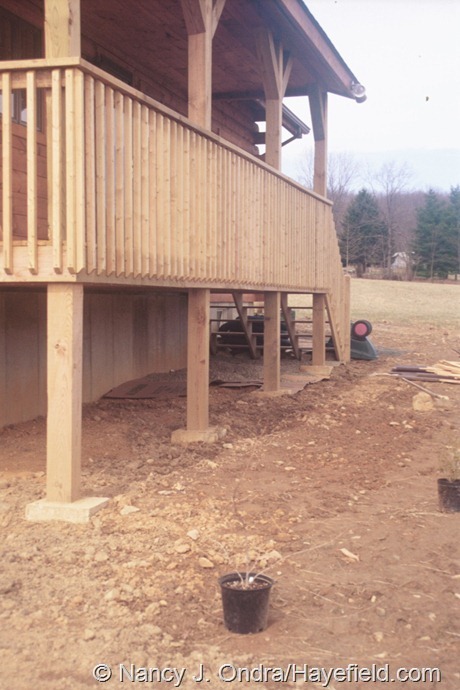 Thank you for sharing this with us, and for all the pictures of the progress. 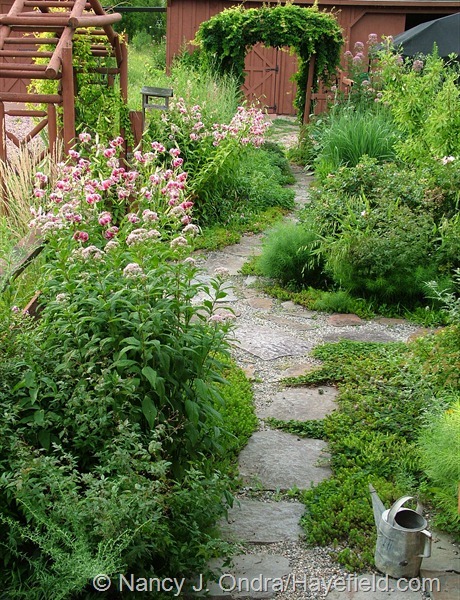 It shows all the work, and change, that went into making your gardens so special. Thank you! Hi there, Carol; thanks for stopping by! These posts were very interesting to put together, but I’m really looking forward to getting back to Bloom Day this month. We are looking to move in a few years leaving behind my established and beautiful gardens. 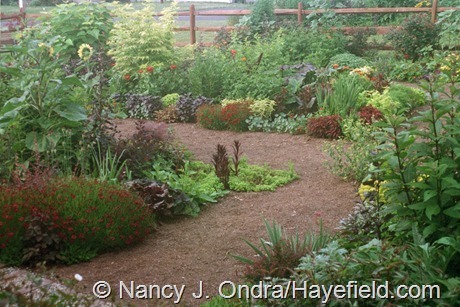 Your garden evolution photos has excited me to begin again! It’s great that you can start planning now, Susan, and maybe get some cuttings and divisions of your favorites ready to take with you. Best of luck to you – and remember to take lots of pictures! New to this blog, and love that you are also in PA, Have you tried Little Joe Pye, which is Joe’s shorter version. I love to look at photos and guess what time of year they were taken. Welcome, Maureen! Thanks for visiting. Yep, I have some ‘Little Joe’, though it’s not really so little; it gets about 5 feet tall here. Thank you for this wonderful voyage in time in your garden. 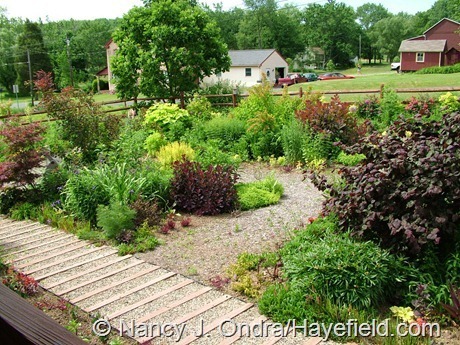 It’s good to see a garden evolution, along with your comments and savvy. I will return to mine with hopeful visions! Hi Jasmine. Thanks for your lovely comment. I hope your gardening season is going well! I was also disappoointed that your starter perennials were plants I can’t get here. Not your fault – I’m just in the wrong continent! But these posts have been so interesting and so useful. I must admit I enjoy them much more than the “pretty picture” ones, beautiful as your pictures are. I’m going to re-read now and take some notes. Thank you for the feedback, Lyn. I know how frustrating it is to see plants that you can’t get. You must have many wonderful Australian natives that will serve a similar purpose. Happy gardening! 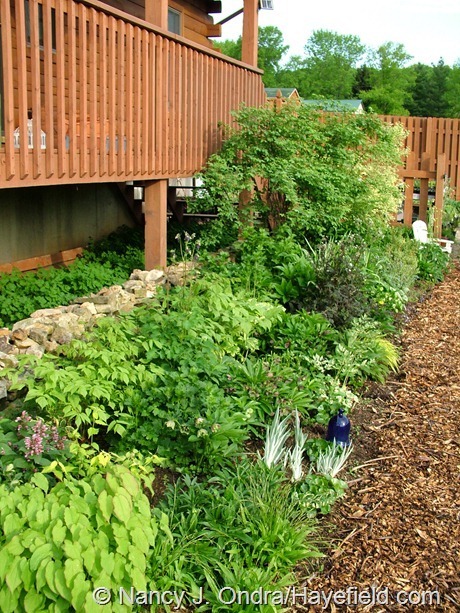 Photos of your garden evolution is quite remarkable! Always refreshing and such a feast for the eyes to see what you’ve done next. I am attempting to tame my yard into a garden and am learning how much (sweat and sore muscles) work it takes to get things started. Your garden is beautiful!! 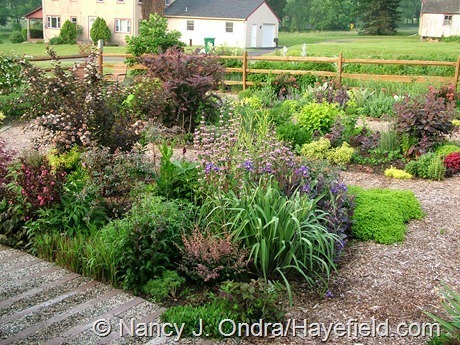 Thank you for sharing your gardens!! Always love visiting your blog. I wish you the best with your garden-making, Joni. It may seem overwhelming right now, but a few years from now, you’ll be able to appreciate your own progress. Don’t forget your most important gardening tool: your camera! I loved seeing the before and after pics, and those from several seasons showing the evolution. Your plant choices are inspiring. I love your Foundation border too. I’m trying to build a red border, and chose to focus on the blue end of red instead of orange-red. It’s harder than anything else I’ve done; I can’t always tell from nursery photos if a particular plant described as red will clash or not. And of course some so-called reds are really bright pink, like the so-called red hyacinths. 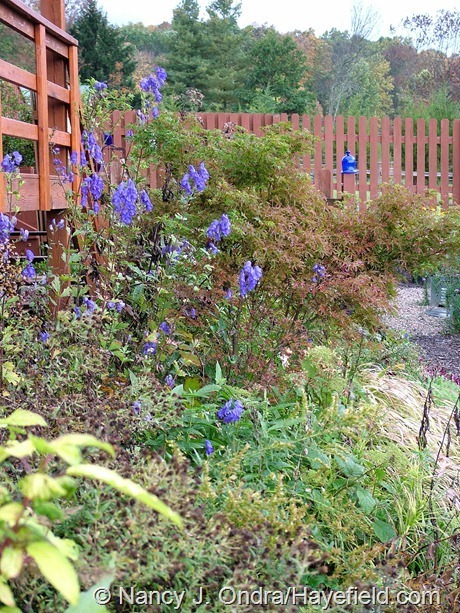 So far I have lots of dark foliage (Diablo ninebark, sambucus Black Lace, weigela Wine and Roses, dark sedums and penstemon) plus plants with dark red blooms (daylilies, clematis, hibiscus, etc), and a couple of lime green Tiger Eyes sumac plants to brighten it up. Not satisfied yet, but it’s getting better. 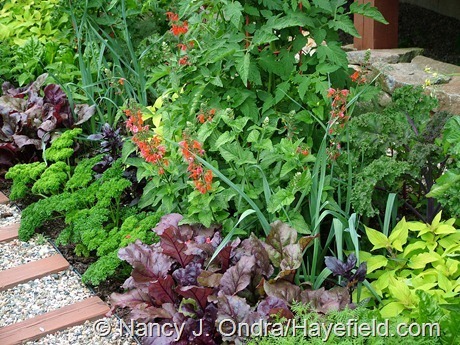 I love your use of chard, plus of course some of the annuals like dahlias and canna. Hi there, Deborah. You set a big challenge for yourself, color-wise; it’s much easier finding scarlets, I think. Either way, the dark foliage really does help to keep the flower colors separated a bit. 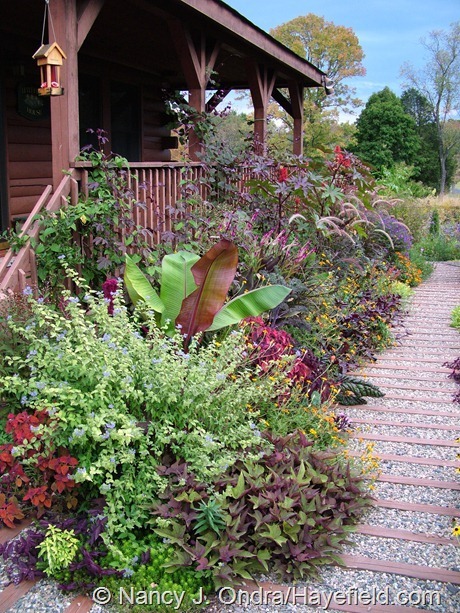 Have fun finding more great plants for your border!